Timmins Camp – Key Project Areas | Central Timmins Exploration Corp.
Central Timmins Exploration Corp. has a total land position of 622 cell claim units and 77 patented claims covering an aggregate area of 135 square kilometers(13,500 ha) located both north and south of the Destor-Porcupine Fault Zone (DPFZ) that are prospective for gold and a suite of base metals. The Company has split its land position into four key project areas based on Townships in the Porcupine Mining District. The Mountjoy Project (Mountjoy and Godfrey Townships) area covers the potential extension of the main Hollinger-McIntyre gold system. 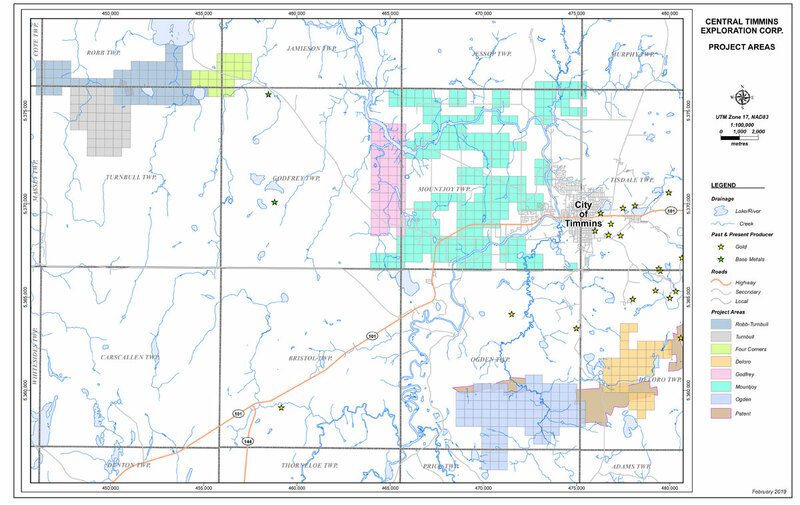 The Four Corners Project Jamieson, Robb and Turnbull Townships) which is prospective for gold and VMS. The Deloro Project (Deloro Township) which is prospective for gold south of the DPFZ includes the Dayton and Lynx Properties that are prospective for gold. The Ogden Project (Ogden Township) which is prospective for both gold and VMS.